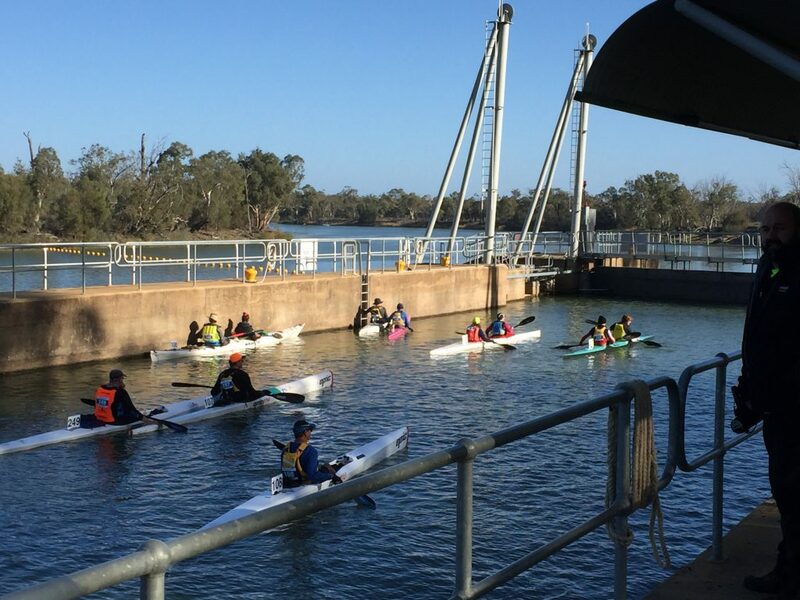 The River Paddling Marathon 200 event run by the Marathon Canoe Club of South Australia held over the June long weekend has again come and gone. 2016 was another very successful year. During the event, AREG was again very ably assisted by the Riverland Radio Club who help with repeater facilities and also staffing of checkpoints. The contribution by AREG (and RRC) to the safety of the participants was again praised by the event organizers and the race director, Martin Finn. This event which sees over 100 paddlers participate in various race categories was in it’s 29th year. It allows paddlers to attempt a variety of course distances, with the most ambitious being the 200km journey from Berri to Morgan. There are also 100km, 50km and 35km options available. Over the three days, paddlers and communications crew members start before dawn and work/paddle through the day, travelling ~60-70km a day downstream on the mighty Murray River. For the AREG members involved, the journey starts many months before, preparing equipment to operate a commercial VHF network. This year, three portable cross-band commercial translators were built for the medics and race director to compliment the VHF mobile equipment operating in the safety boats. AREG must thank WICEN SA for the use of their commercial licenses this year which enabled us to operate this network. 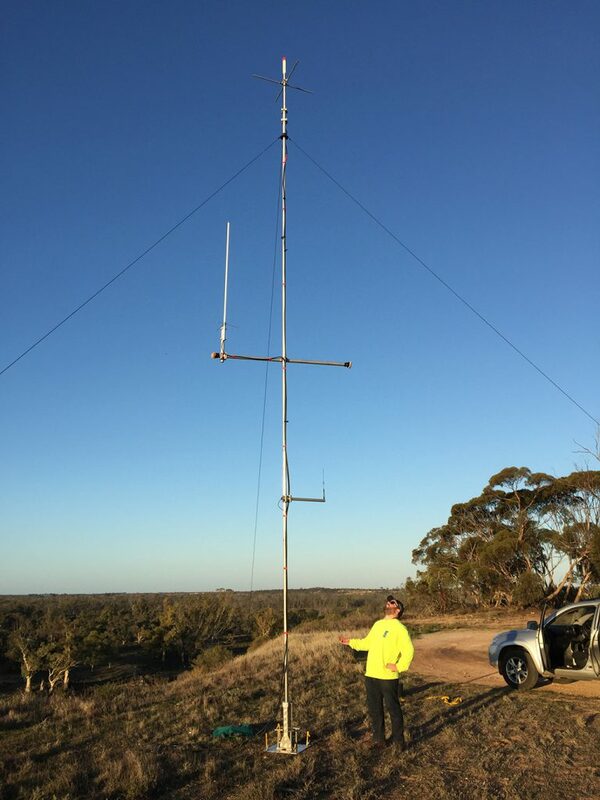 Constructing gateways to enhance the APRS network coverage across the Riverland as well as developing the capabilities of the command bus (thanks to Peter VK5KX). The APRS equipment consisted of two roaming iGates developed and assembled by Andrew VK5XFG and Grant VK5GR. 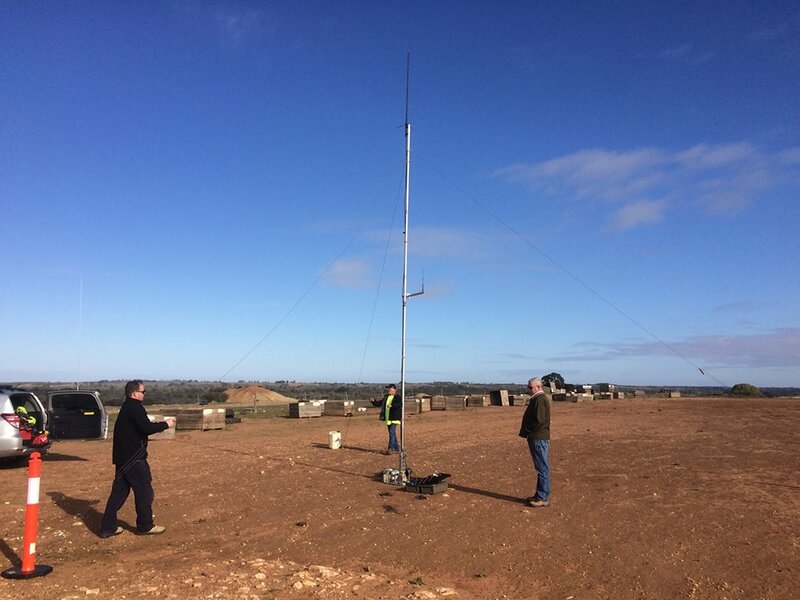 One of these was located at Rob VK5TRM’s QTH in Loxton, while the other was used portable at several locations including Loveday and Sunlands (fed via 3G Cellular Internet). The enhancements to the APRS coverage this year were very worthwhile, although equipment failure on day 2 hampered coverage for part of the event. On top of the equipment, there are hundreds of hours spent by club members planning rosters, registering radio operators, designing/planning the radio communications networks and working out the details of the safety plans with the Marathon Canoe Club. This keeps Grant VK5GR, Andrew VK5XFG and Matt VK5ZM, very busy for many nights before the event. Another major enhancement this year was the further development of the command and control software for the command bus. This developed and written by Scott VK5TST and aided significantly in the management of boat tracking and safety management for the event. Scott not only wrote the software but also provided the LAN infrastructure for the 7 machines that were used to run the event. Most of the crew travel up to the Riverland on Friday afternoon. Upon arrival, the first main task was to setup the radios in each of the safety boats. These are provided by the Victor Harbor Sea Squadron and were met at Waikerie by the AREG install team. The event kicked off without a hitch, starting on time from Berri with the 200km event paddlers kicking off shortly after sunrise. Matt VK5ZM met the start crew. After a minor issue with a lost support boat, everything was set the starters gun was fired! The first checkpoint was Lock 4 a few miles downstream. Comms were established by Chris VK5CP, Lena VK5FUNN and Matt VK5ZM back to the mobile command station run by Grant VK5GR on a hill overlooking Lock 4 easily on both the commercial and amateur networks. One of the support boats did have some difficulties meeting up with the participants on the downstream side of the lock however, as the river flow was very low and navigation was made very difficult by the myriad of sandbars in this stretch of the river. Fortunately the support boat made it just in time. 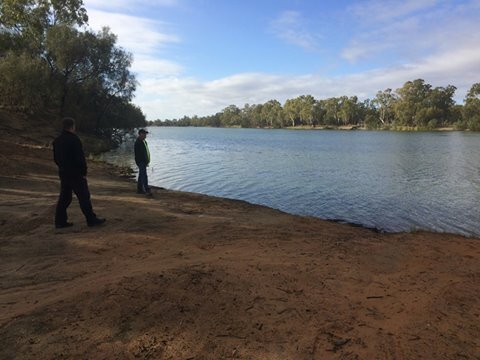 Finally, after the participants made it through the lock, the event proceeded past Rilley Island manned by Mark VK5QI and Gary VK5FGRY before heading on to Loxton, where the M100 starters joined the event. 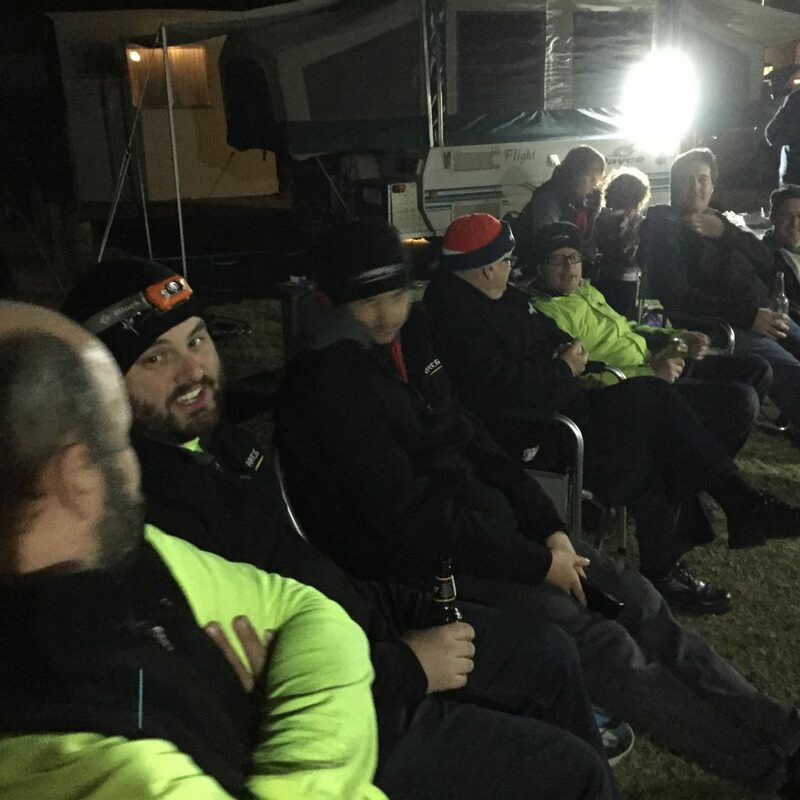 The Loxton checkpoint was ably staffed by Ivan VK5HS, Peter VK5FLEX, Rob VK5HRS and Kim VK5FJ, a mixed crew from both the Riverland Amateur Radio Club and the AREG. the rescue (again!) and jumped into each boat, making running repairs so that everything could continue smoothly. After Loxton, the next checkpoint was Pyap manned by Rob VK5TRM and Louis VK5FLY, which had been relocated since the previous year. Then came a new checkpoint for 2016 in Loveday 4WD park operated by Dennis VK5FDEN and Paul VK5JG. The AREG and the MCC organizers were most grateful to the owners of the park who granted access to the waterfront inside their property so that we could guarantee safe passage of all of the paddling participants. In addition to the checkpoint, a portable APRS I-gate was established to assist with collecting the APRS data from the course boats as they traveled down the river. Thanks to everyone involved in setting up this system! By the time the paddlers reach Loveday they are starting to get tired, and from here down, numerous incidents occurred. This kept the command bus crew and Andy VK5AKH, Andrew VK5XFG, Ron VK5MRE,Rob VK5TS and Sandy at E7 (New Residence) very busy. Fortunately each of the incidents was minor. The command bus on Day 1 was located at the finish line at Moorook. Peter VK5KX put on some excellent coffee and hospitality which allowed the command crew to efficiently and comfortably go about their tasks. All told, Day 1 was a roaring success, with the exception of some minor issues with the commercial network. We hoped that would be the last of the gremlins, but that wasn’t to be the case…. After a hard day’s work, everyone returned to the Kingston on Murray caravan park and was treated to the AREG catering service when Sharon VK5FSAW and Irene Hall rolled out a delicious baked spud and pulled/shredded roast lamb dinner with apple crumble for all of the radio volunteers. This on top of the lunches provided to all of the AREG crew members made a huge contribution to the event. Everyone sent a big thank you to Sharon and Irene for their efforts! Sunday started as planned on time from Moorook. Gary VK5FGRY and Matt VK5ZM drew the short straw and attended the first checkpoint, while Mark VK5QI and Andy VK5AKH manned net control and checkpoint 9 at Kingston on Murray. Matt VK5ZM took great delight in replacing the first of the TAIT radios in the red-box boat systems with a loan radio from Ivan VK5HS, one problem solved for the remainder of the weekend. Lock 3 was the next checkpoint which was manned by Matt VK5ZM (after a hasty drive from the start), Andrew VK5XFG, Grant VK5GR and Sharon VK5FSAW. Unlike last year, everything ran smoothly through the lock and all of the paddlers went on their way without incident. Chris VK5CP with Lena VK5FUNN manned checkpoint 11 at Wigley Flat and solved the coverage/access issues there this year with a translator on a short mast. This was also the VK Shires contest day, and occasionally there were communications issues with Wigley Flat. We suspect some 40m action was distracting the checkpoint operators during the lead up to the first canoes appearing (*grin*). At least the contesting spirit could partially be kept alive whilst running the event at the same time. Checkpoint 12 was the main 100km race start at Devlins Pound. This was manned by Louis VK5FLY, Mark VK5QI, Gary VK5FGRY, Rob VK5HRS and Kim VK5FJ. The AREG this year has tasked additional people to these big starts so that we have two people tracking paddlers arriving into the checkpoint, two tracking the departures and one following the race director and handling paddler incidents. This arrangement proved very helpful in maintaining organised control at these major checkpoints. While the checkpoint operators are hard at work, the second command team was operating from a high location near Holder. 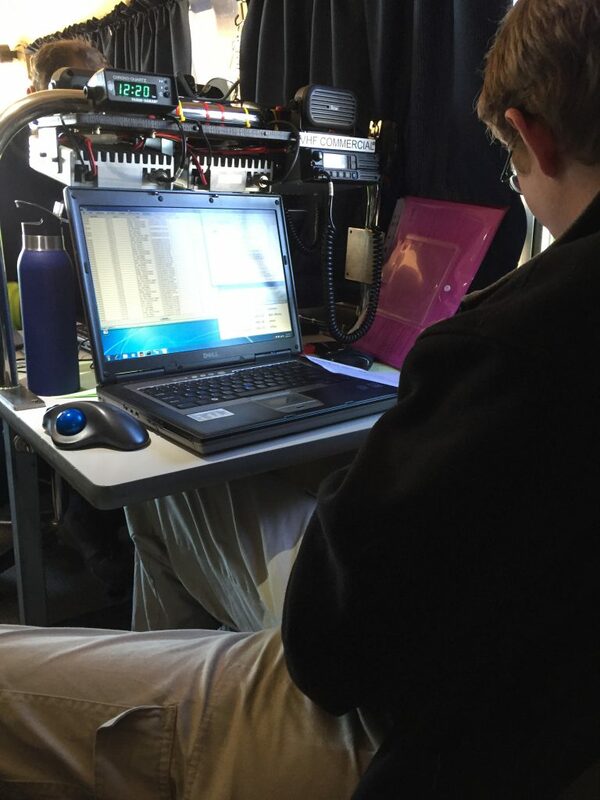 Scott VK5TST was using his new software to keep track of the event whilst the operators in the bus kept track of things over the radio networks. Whilst here, our command bus was visited by the race director and his wife on their way through. Both were shown the “smooth operating” and “technology” being the scenes used to keep track of the event. The gremlins kept coming however within the VHF commercial network with communications difficulties being experienced between Overland Corner and Devlins Pound. There were more suspected equipment hiccups too, which further complicated things. This gave the Holder and Kingston command stations some headaches trying to hand over control between them whilst maintaining continuous communications. It also became apparent that the GPS receiver on one of the rescue boats couldn’t see enough of the sky, so keeping a location track on him meant a lot more reliance on location reports being passed over voice. Sigh…. more work for next year! As the day wore on, Checkpoint 13 finally opened at Lowbank east of Waikerie. This is the mini marathon start on Day 2, which was manned by the Riverland Amateur Radio Club team. Always a challenging checkpoint due to the width of the river here, the team did an admirable job spotting, logging, tracking and reporting, no paddlers were missed. 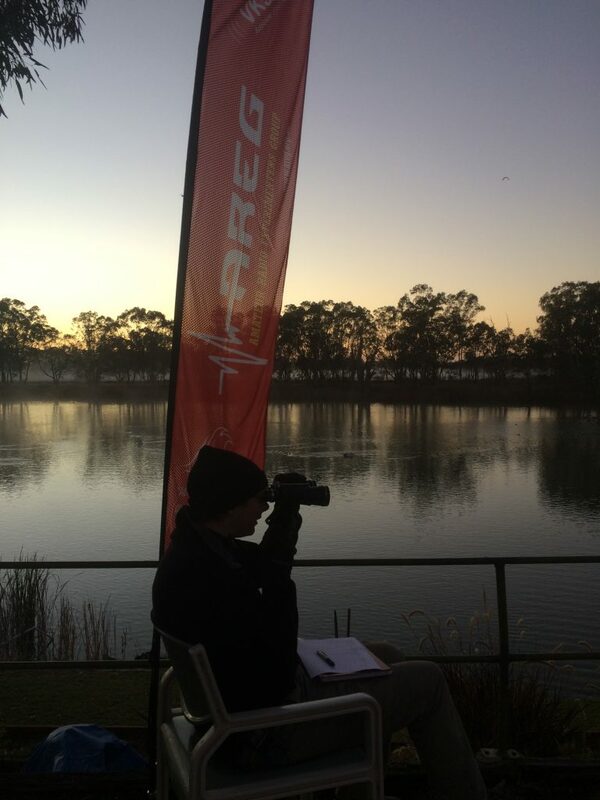 Day 2 finish was at Waikerie. Paul VK5JG, Dennis VK5FDEN and Irene did a great job working with the MCC time keepers (Ray VK5RR with his MCC hat on) to log everyone off the river at the end of the day. Day 3 started off very cold and clear. Frost had descended on the land and the trees had been turned white in our headlights as the first team members left home at 4am. 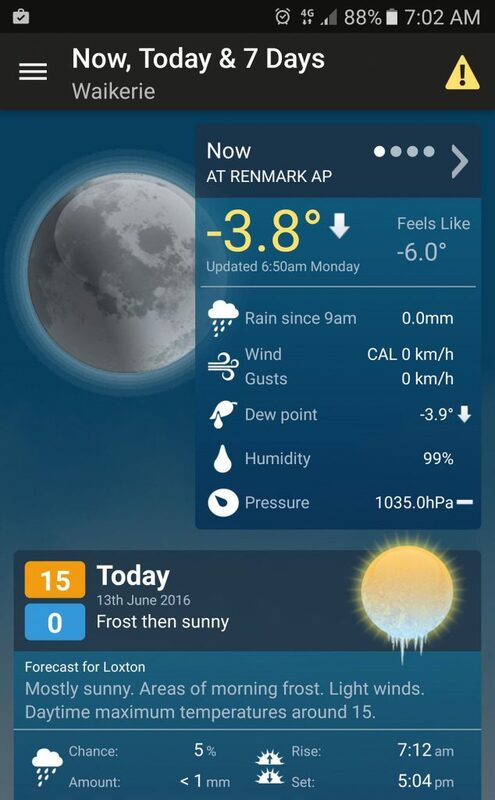 The temperature dropped to -3.8deg C just as dawn broke, and highlighted one of the key risks that everyone in the event management team works to mitigate, hypothermia. This is one of the reasons why the communications capability and the ability to track paddlers and send help is so important to this event. Andrew VK5AKH and Grant VK5GR were the first to head out, heading for Sunlands to finish setting up the Commercial VHF and APRS repeaters. This was a new site for the event and far exceeded our expectations. We are indebted to the land owner in the area who was happy to host our repeater for the day. Loius VK5FLY drew the short straw had manned the start of Day 3. As the paddlers marshaled at 5.30am it was as cold as it could be, but all got away safely. Scott VK5TST then logged them through the Sunlands pump checkpoint, whilst on top of the cliffs Grant VK5GR and Andrew VK5AKH manned the field command station. Next came lock 2. Matt VK5ZM lead the team, showing Kim VK5FJ, Rob VK5TS and his wife Sandy the ropes of lock procedure. After a trouble free passage through the lock, the 200km marathon paddlers headed for Hogwash Bend and on to the new start line for the 100km marathon this year at Caudo Winery. Louis VK5FLY, Dennis VK5FDEN, Irene and Paul VK5JG manned the M100 this year and benefited from the hot croissants tea and coffee put on by the winery. This most civilized start line will become hotly contested by checkpoint operators in future years! The gremlins again come out to play! Last year, it was the Day 3 100km start line where radio problems struck for the medics and it happened again at the same checkpoint. Their radio failed when the fuse blew on the charging circuit allowing the battery to be completely discharged. VK5AKH and VK5GR stopped past the checkpoint on their way to the bus and made arrangements to swap the medics radio over to the spare translator in the other medic’s car, whilst implementing some temporary repairs to the first one. Everyone was left happy and communications were again restored. However, this was not where the gremlins stopped. Another one of the safety boats was also intermittently experiencing problems with their radio. Up at the command bus, all hands scrambled to put together a replacement for the radio and one of the team headed off to do a radio swap. Just as they were about to cross the ferry, the faulty radio started working again. Matt VK5ZM (the communications officer) was heard over the radio telling the boat operators that if it failed one more time they could “use it as a boat anchor”. Everyone chuckled, including the boat operators, however it does mean we have a lot of work to do for 2017, as the decision was made there and then to retire the ageing TAIT radios and update them. Incidents on Day 3 poured into command thick and fast with reports of other water craft failing to heed the 4 knot speed limit in the closed segment of the river. The river closures were a new development for 2016, intended to support paddler safety and reduce the number of paddlers going for a swim. The problem is that even a modest wake from power boats can be very treacherous for the paddlers, particularly if inexperienced (such as some of the first time participants) or if they are exhausted from the previous 2 days of effort. Not all river users heeded the restrictions however, causing a few paddlers to be tipped into the river. These unfortunate paddlers had to be taken ashore, warmed up and checked over by the race medic before being allowed to continue on, with all efforts coordinated through the Command Bus team. Finally the paddlers made it past Molo Flat and Cadell landing checkpoints, and the last start of the event at Cadell for the Mini Marathon got away cleanly. The race was on to the finish line in Morgan, and the conclusion of another very successful event, both for the Marathon Canoe Club organizers and for the amateur radio network operators from AREG and RRC. The AREG organizing committee would like to say a massive thank you again this year to the entire AREG and RRC team who combined to make our contribution to the event a success. It was great to see some new faces on the team this year and the committee would very much encourage members who haven’t come along previously to consider doing so in 2017. It is a great weekend, in some beautiful countryside along the banks of the mighty Murray River. Whats more, it is a great way to combine Amateur Radio and community service, something which always strengthens friendships and further support for why the Amateur Radio service should continue to be supported. A big thank you also to all of the members who contributed to the multiple working bees in the months leading up to the event. Without your efforts we would never be able to pull together the communications network that we do. Looking forward to 2017! See you there….. This entry was posted in River Paddling Marathon by AREGNews. Bookmark the permalink.